The Philippine Rugby Football Union (PRFU) is the official governing body of Rugby Union in the Philippines. Over the last decade, the PRFU have continued to teach, grow and develop the sport of Rugby and its values throughout the country. The PRFU was founded in 1999 and was granted full World Rugby membership in 2008. As a non-profit national sports association, the PRFU are dedicated to further develop rugby at a grassroots level throughout the Philippines. Over the last decade the sport of Rugby Union has become more popular in the Philippines as it has seen the success in both the Men and Women’s national team programs. 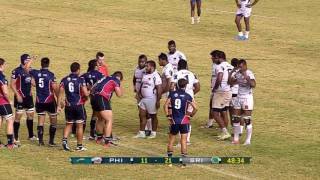 The Filipino public is starting to admire, learn and support the sport of Rugby Union as the Philippine Volcanoes have proven to attract supporters with successful performances rising from the sixth tier of the Asia Rugby Championships to the first tier in successive years. The Philippine Volcanoes are the only team in Asia to achieve this feat. The 7s format has also seen the Philippine Volcanoes on a remarkable rise proving nothing is impossible after qualifying for the 7s Rugby World Cup in 2013 just five years after their inclusion in the Asian 7s Series. The most recent successes have seen both the Gold medal finish for the Men’s and the Bronze medal finish for the women’s in the recent 2015 South East Asian Games held in Singapore. The team name Philippine Volcanoes was adopted from the 1st Filipino Infantry Regiment composed of Filipino Americans who saw battle during World War 2. The first Philippine National Rugby Team that participated in their first international tournament was a mix of Expat and Filipino players. Thus, the team name.